My brother, Greg, loves cars. He could tell what year a car was by the details. His first few cars were a series of used cars. He shared the old family station wagon with our older brother Steve. Greg was the first to get his own car. I remember he had a Fiat, a Ford Fairlane, an orange pick up truck and a newer blue truck. Greg's first new car was a yellow Trans Am Firebird with t-top. Greg's first stop was to take mom for a ride. After this, mom expected anyone getting a new car to take her for the first ride. The Trans Am was stolen. Greg got a VW Sirocco to replace it with. The Trans Am was found at the airport stripped. The VW dealer lost Greg's Sirocco. They had to report it stolen. The found it and Greg got it back. Then it was stolen for real. Greg reported it to the police and was told it was already stolen. Apparently the VW dealer never reported to the police that they had found the missing vehicle. My brother, John, bought his first car with money he saved from his paper route. It was an AMC Pacer. It was a fun little car. But he let someone else drive it and they got in a crash. Mom was so angry that he let someone else drive it. Our insurance didn't cover that. I had to share my first car with Nancy. It was a 1972 Toyota Corona in brown. It was mostly Nancy's car until she left for college. I had to pay her $3 a week to take me to school. She also picked up some friends who paid her $5 for the ride to school. Nancy worked after school so we had to ride the bus home. Once the car was mine, I had to fill the tank. I realized what great mileage this little car got. Nancy never had to pay for her own gas! My dad was never much of a mechanic. He didn't do his own oil changes. But on the Toyota, he replaced the muffler and even did some bondo. Nancy was driving us to school after a heavy rain. She was passing a car on the right and through a puddle. It was deeper than she expected and she got soaked. We knew there was some rust but didn't know the floor board was basically gone. Nancy was covered with muddy water from head to toe. Was a glorious day! I laughed all the way to school. She dropped us off and went home to change. I laughed all day. After I had the car for a couple of years, it started developing a weird shake. First, it would shake if you drove over 65. Not a problem since I didn't do much interstate driving. Then it would shake if you were driving at 25 miles per hour and hit a pothole. Detroit is nothing but potholes. Our high school had a automotive shop. You could get inexpensive repairs, you only paid for parts. I took my car in to see what was the problem was. I went to pick it up and the automotive teacher approached me and told me not to drive this vehicle. The frame was rusted and it was unsafe. I drove it home and didn't drive it again. My mom sold the car to a friend for parts. It had new tires, new exhaust and a new battery. The new owner sold it someone else who continued to drive it! I met Nick in college. His dad used to say nice guys finish last. It was Nick's aim in life to prove his dad wrong. Nick wore a man's dress hat to class. Something that would have been considered hip today but was just odd back then. Nick had a brown Trans Am. Nick was not a Trans Am kind of guy. He never drove it fast. And it was brown. Why would anyone want a brown Trans Am? I borrowed Nick's car once to go see my mom in the hospital. I drove it on the freeway and let it go a little fast to help clear up its clogged workings. This fast car was masquerading as a family sedan. Nick's car was stolen. He thought that someone was playing a trick on him. He really thought our friend, Greg, had taken it as a joke. Campus security reviewed its camera and found that it was someone else. Not anyone they could or would ever identify. Our last semester in school, we all talked about getting new cars. Our design professor hated the talk. His family own a car dealership but he never owned a new car himself. He thought it was a waste of money. He was an odd ball. That summer was hot. Our design class met every afternoon from 1-6pm. The building was old and did not have air-conditioning. All we wanting to do was sleep the afternoon away. But he insisted that we be there. He took role call at the beginning and end of class and counted it towards your grade. He also wore polyester work clothes and never sweated. My car during college was a 1972 Buick Centurion. It was big and bulky and guzzled leaded gas. It had A/C but would blow a fuse every time you turned it on. I only used it when it was absolutely necessary as each fuse was two or three dollars. I started looking at cars and even went to a Toyota dealer to get a trade in price on my Buick. They offered me $300. My mom paid $250 five years earlier. That evening, I was driving home from school. I was on the freeway and I saw smoke, It was coming from under the dashboard. I was in a somewhat scary neighborhood but I pulled off the freeway. I pulled into a service station, they still existed back in 1988. I made the mistake of opening the hood. The rush of oxygen made the engine catch fire. The mechanics sprung into action though I couldn't understand any of the since they were all from the middle east. The ran around and put out the fire. I called my dad and he came to pick me up. The mechanics looked at the car while I waited. They fixed it for less than $50. When I got home, dad told me to call Toyota and get the new car. They did not ask about the old car and I didn't offer up that there was a new problem. They gave mom the $300 who gave it to. 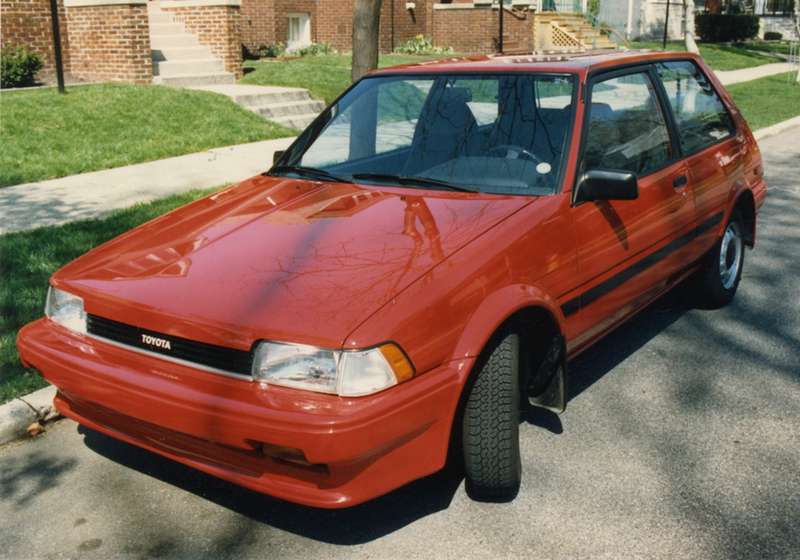 I had my first new car, 1988 Toyota Corolla FX. It was red and a five speed and I loved it.